Observed near Insinya, Kajiado, Kenya. Dec. 2014. Black Cotton Soil often supports grassland vegetation and grazing animals often keep the grass short. 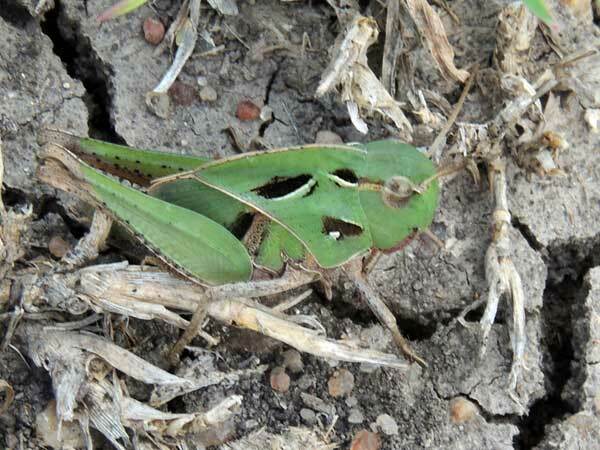 This grasshopper is perfectly marked to avoid detection by visual predators like birds. Black streaks and bright white dashes suggest the soil and bleach grass stems, while the ground color matches a living grass blade exactly. The pro- and metathoracic legs resemble dry rhizomes of grass. Notice how a pale line cuts across the eye, which might otherwise attract the attention of a hungry grasshopper eater. This female grasshopper has her tail-end deep into the soil where eggs are being deposited. She is utilizing one of the deep cracks that characterize the vertisol soil type. Copyright Michael J. Plagens, page created 10 July 2015.